it is another to make them write it for you! Neil Dial, CEO, Adflex Solutions, Inc.
"I have now implemented ASC's tools and techniques in three different companies with the same dramatic results each time. First at Motorola, then at Alphatec and now at ADFlex Solutions, Inc. This methodology has brought an in depth process knowledge which reduces scrap and makes processes much more robust. In the latest implementation here at ADFlex we have reduced scrap by 54 % in the last 9 months and we are just getting started! This improved process efficiency is leading to shorter cycle times and smoother introduction of new designs. What makes Mario stand out from the crowd is the pro-active approach his methodology uses. While others advocate passively waiting for 'signals' on charts to indicate that something has changed, M/PCpS takes a direct and incredibly faster approach. Actions introduced into the system force causal relationships to become apparent. Undesirable results are then eliminated and controls are put into place to ensure the process stays at optimum. If you are serious about increased process capability, reduced scrap and shorter cycle times then M/PCpS is what you are looking for." "...we have reduced scrap by 54% in the last 9 months." "Good, practical approach to tackling difficult manufacturing problems. Good class notes, and straightforward, concise approach." "M/PCpS methodology is an extremely well planned, step by step course on 'how to' design, plan and complete Characterization Studies. Most seminars that I have attended are predominately theory with very little applications. The instructor's experience and knowledge was excellent and made the seminar extremely enjoyable. Probably the BEST seminar I have ever attended - approximately ten in the last three years." "Mario, excellent course. I believe that I have learned more in four days than I had in my 25 years of previous courses. Bravo!" "Time well spent - would like to see more courses at this realistic level. This is how to really improve yield - not just sell books and software." "... your presentation was the best one I went to that day and one of the most excellent ones I have gone to. The strength of your presentation was the integrated approach ... which included everything from process capability to Taguchi Design of Experiments..."
"I am very satisfied with the course. I am impressed with the knowledge of the instructor, and with his presentation skills. One of the most valuable aspects of the course was applying it to an actual equipment application." "Mario Perez-Wilson brings complex manufacturing techniques and tools and outlines a simple methodology that engineers can use in their day to day activities to characterize, improve and control both simple and complex manufacturing steps. This methodology can help in the path of continuous quality improvement and in becoming a 'total quality' organization." "Use of SPC is the way to keep our leadership in the high-tech marketplace and to have a methodology and/or system such as the one developed by Advanced Systems Consultants which has all the elements is a winner." "If you want to achieve 6 Sigma, Mario's Methodology will help you unlock the door. I highly recommend his methods. It has helped me make large improvements in my company's bottom line." "I liked the seminar very much. I only wish more companies would use it. I think it's what it will take for the U.S. to grow. I think the methodology is what America needs." "I have taken classes with Deming and Montgomery but this class was by far the best. Mario's approach is very simple and practical. I look forward to taking further classes with him." "I was very pleased with the course...this process capability methodology is our springboard to reducing the variation in our machines/processes and improving our product quality. The methodology requires and encourages solid engineering and can lead to permanent improvements." "I enjoyed Mario very much. You are well-qualified to teach! Hope to hear you again soon!" "Simply outstanding ... method really illustrates a disciplined approach to solving manufacturing problems. It achieves this with a logical progression through sound principles and techniques - not just abstract theory." "This seminar was outstanding at organizing the tools for improving Process Control. This is the kind of focus that is needed to bring industry to the quality level required and compete in today's marketplace." CR Bard USC 1 Div. "... Mario, in his book Machine/Process Capability Study, has produced a system which prevents the costly redundancies in product/process development and focuses an Engineering structure to encompass the techniques of experimental design and communicate results that infuse quality in products, processes and services." "An excellent program for the manufacturing environment. Mario is very knowledgeable and his seminar and methodology stresses the importance of understanding your process and then optimizing." "Excellent presentation; questions were answered in a clear manner. Work sessions helped ingrain steps together taught in lecture." "I have attended several SPC courses from, Six Sigma, DOE & Designed for manufacturability. This is by far the best course ... Great combination of theory and practice." "Excellent and inclusive presentation of the procedure to attain processes that meet and maintain the high quality standards required (demanded) of business today." 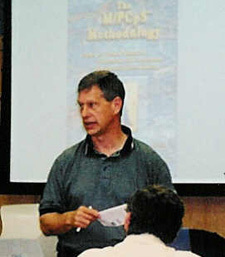 "Many people have presented these techniques in many other seminars. Mario Perez-Wilson has significantly added value by organizing these techniques into a workable methodology and demonstrating how it can be applied to produce the desired results." "Your book is one of the easiest and useful ones I have ever seen. With your presentations and book people are gaining the knowledge to do things right from the very beginning (knowledge so much needed in the American Companies)." "Highly valuable class. The book looks like it will be a valuable reference. I'm going to recommend our prime contractor (Douglas Aircraft) to contact you for copies of the book, and possible seminars." "One of the best seminars I've ever attended. Entirely pertinent to my job. Very well done material - delivered expertly." "Although the methods were slightly different than what I have been using, the differences were explained in an excellent manner." "This class was excellent. It was nice to have a class that was easy to understand and applicable. Very well organized and well instructed. Great book also!" "...American industry will do well to pay particular heed to Mario Perez-Wilson's "recipe" in its quest to restore its manufacturing leadership in the world." "Good nuts and bolts approach. Every concept was thorough...related to real world." "The most comprehensive methodology I have seen to date for people who are serious about improving machine/process capabilities and who are willing to work at it without looking for the proverbial short term windfall." "A concise and lively presentation of a set of fundamental tools and a simple application of their use to control processes.."
"The industry would do very well if people and companies would make the deep commitment to the M/PCpS methodology."